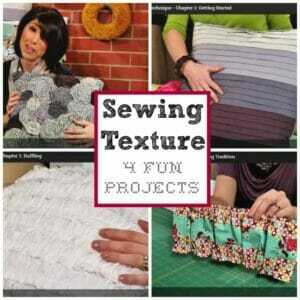 Did you read the review I wrote of the Sewing Texture class last month? So far, I've just completed the one project although the class gave me lots of ideas and tips which I have filed away into the inspiration section of my brain for future use! 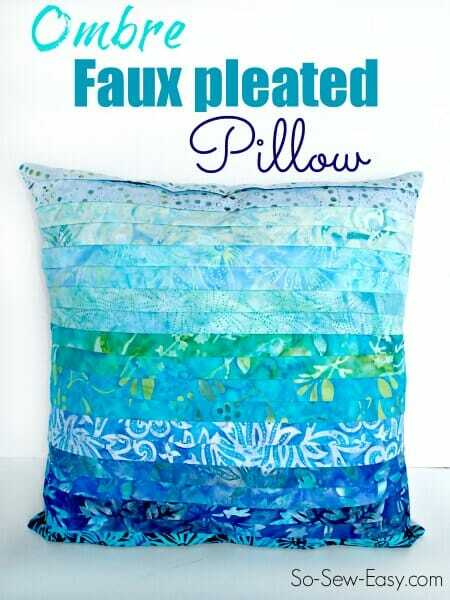 Today I'm sharing with you my “Cayman Colors Ombre Faux Pleated Pillow”. When I first saw this project I was actually a little bit intimidated. Accurate and straight sewing has never been overly important to me, I admit. I'm a speed-sewist. The challenge of getting all those pleats the same size and distance – was I up to it? I thought not, but then based on the lessons in the class, and a little planning, it was no where near as hard as it looks. 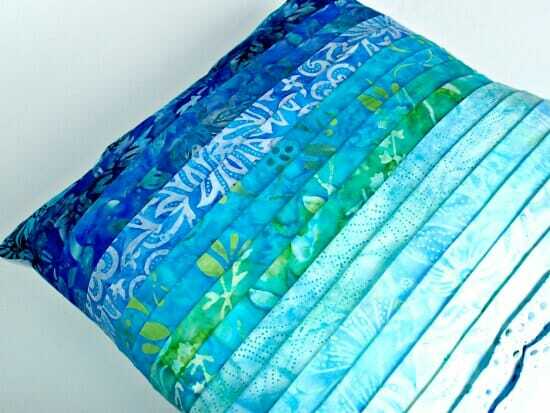 Because I was using a jelly roll, the pieces were already pre-cut so I just had to fold them in half to make the pleats. Easy to be accurate. Vanessa talks us though in the class how to work out spacing, and I drew my lines across my ‘anchor' fabric, lined up the folded pieces and it was sewn in no time! 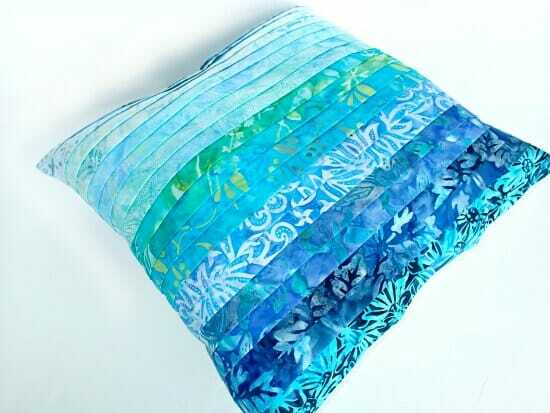 I love the way it really does include the same colors as I see out of my window everyday, looking out onto the sea, from the very clear and light on the sand near the shore, to the deep indigo blue as the depth of the sea drops far, far away into the Cayman Trench, and every shade of blue in between. This easy technique produces a very nice finish that looks like it was a lot of work, when it really isn't! I think this would look beautiful on the bottom of curtains or blinds, as an accent on decorative towels in the bathroom, or even as a decorative panel for a tote bag. If you are interested in adding a little texture to your sewing projects, check out my review of the class by clicking this picture. 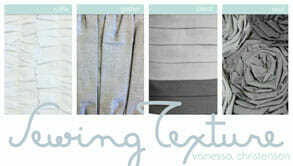 Read more about the Sewing Texture class here. If you like the sound of this class and want to find out more, please use this link to claim your 33% off the class price - just $19.99. How wonderful to have a view of the ocean, Deby. 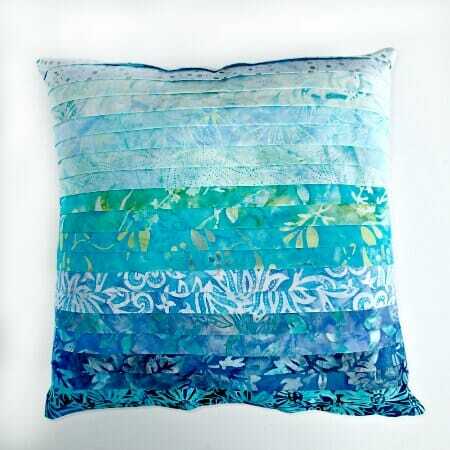 Your cushion looks fabulous.